Growth habit Straight, cylindrical trunk with a narrow, upright oblong crown. Found throughout the eastern United States from Nebraska and southeastern Minnesota to southern Ontario and Quebec. Found south to Georgia, Alabama, Mississippi, Louisiana, and eastern Texas. While Shagbark hickory is one of the hardiest of the hickory species and is adaptable to a lot of soils, it prefers well drained, rich loams and humid climates. Growth rate 60’- 80’ with some specimens reaching 100’- 120’. Foliage Leaves are alternate, pinnately compound, and are 8-14” long. Each leaf consists of five leaflets. Very rarely a leaf will have seven leaflets. Each leaflet is 1/2″-2-1/2” wide and finely toothed. 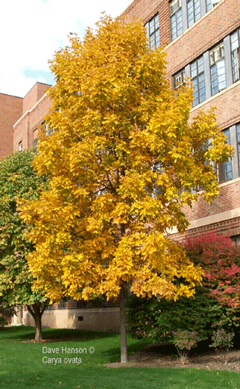 Leaves are a deep yellow-green in summer turning a rich yellow to golden brown in fall. Twigs Twigs are stout and reddish-brown to light gray with lots of pale prominent lenticels. Twigs can be somewhat hairy or smooth and shiny. 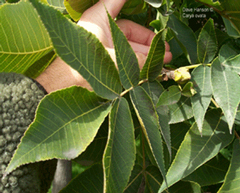 Buds Buds are large, brown, and blunt pointed with 2-4 visible overlapping velvety loose fitting scales. Terminal buds are 1/2″ to 1” long. Fruit The nearly round, 1-1-1/2” diameter fruit usually ripens in October and drops from the tree. 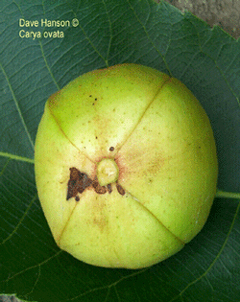 The green fruit, or nut, is enclosed in a four-valved husk that turns brownish black and often splits open when ripe. 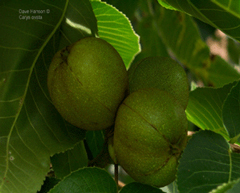 The edible, white nuts are quite sweet and pointed at one end. Many species of wildlife consume hickory nuts including squirrels, chipmunks, bears, rabbits, foxes, and some birds. Bark On young trees, bark is smooth and gray. On older trees, bark exfoliates into long flat plates that are unattached on both ends and attached in the middle. Plates can also be attached at one end (either top or bottom) and free at the other. This gives the tree its characteristic shaggy appearance making it easily distinguishable from other trees in the forest. 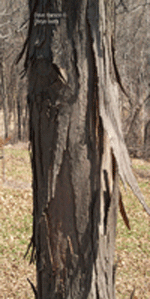 Insects and diseases The most often seen and serious fungus of hickories is canker rot. The fungus, which can eventually spread throughout the heartwood, starts as cankers around dead branch stubs. There are many other known fungi and diseases to affect hickories, but most are saprophytic and do not harm living trees. A bacterial disease, crown gall, also affects hickories causing lump-like growths on the roots or the base of the trunk. Mildew and anthracnose are also common diseases of hickories. 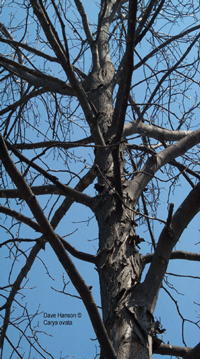 There are many species of insects that infest hickories, but few cause significant damage. The most serious insect pest of the hickory is the hickory bark beetle. Outbreaks can develop during drought periods and large numbers of trees can be killed. Landscape value Hickories in general have limited landscape use. Seedlings of Shagbark hickory can develop an extremely deep tap root, 2-3’ deep in their first growing season. This makes the tree very difficult to transplant. 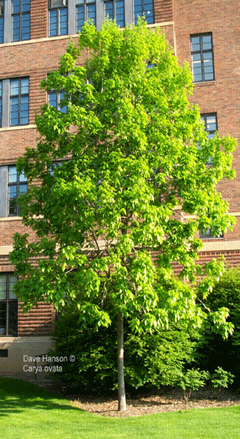 Due to difficulty planting and slow growth rate, Shagbark Hickory is not often planted in the landscape. Interesting uses Hickory is an extremely strong, hard, heavy, and shock resistant wood. Its lumber is used for furniture, flooring, and tool handles. Hickory wood has a high heat value, burns evenly, and produces long-lasting steady heat making it a very popular fuel wood. It is also popular as a charcoal-producing wood lending food a hickory-smoked flavor.